Mission’s Candlelight Parade kicks off the holiday season! MISSION, BC, DECEMBER 07, 2018. The night is clear and crisp… a light wind blows giving a wind chill of -4°, the ultimate conditions to start off the 34th Annual Candlelight Parade held in downtown Mission. Bundled up in their warmest winter layers, over 14,000 spectators braved the cool weather and were treated to the perfect night to enjoy the 90 minute spectacle. President Andrea Walker was thrilled with the evening stating, “Each year keeps getting better and better and this year even the weather finally cooperated. Thank you to all the participants and volunteers for a job well done.” A total of 92 float entries paraded down Mission’s downtown core, bringing together over 140 vehicles and more than 1000 participants marching in this years parade with varying arrays of lights, music and holiday spirit. Dance troupes, bands, bikes and even a unicycle performed along the way. This year’s winners were classified into eight separate categories for judging and all were rated based on their holiday cheer and entertainment value. Candlelight parade originally started as a day parade more than 40 years ago and has operated as a nighttime parade for 34 years. Candlelight Parade is the longest running night time parade in Western Canada It has only been cancelled once due to a heavy snow storm. Mission Chamber of Commerce has organized the parade for the last 29 years with the support of sponsors, District of Mission, Mission RCMP, Mission Fire Service, businesses and more than 100 volunteers from community organizations including the Mission Optimist Club and Fraser Valley Radio Operators Club. Parade planning begins in August annually and is managed by a volunteer task force of those involved. Over 14,000 spectators attend annually from as far away as White Rock, Bellingham & Hope Average of 80 floats each year, from bands to schools to businesses. Entrants come from all over the Lower Mainland. THE BEST ADVERTISING DECISION YOU WILL MAKE IN 2019 Keeping you informed at home or on the go. Your community news source. The Mission Candlelight parade is the first sign that the holidays are here. Our night parade is the largest holiday night parade in Western Canada and brings over 14,000 spectators from all over the Fraser Valley. 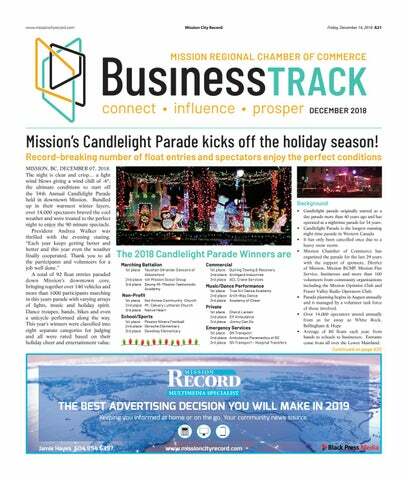 This year we had over 90 floats, a true testament to the festive spirit of the businesses, clubs, and organizations of Mission. On behalf of the Board of Directors, I would like to thank our membership for a successful 2018 and wish all of you a holiday season filled with Peace and Joy. Winners will be announced on December 18th by 4:00 PM. ***Maximum 5 submissions per person ***All submissions consent to the Mission Regional Chamber of Commerce using your picture(s) in future promotional use. LIVE FEED of the Parade is also available on the Mission Chamber FB Page! The Mission Chamber would like to thank: staff of Mission Public Works & Parks & Recreation, Mission RCMP, Mission Auxiliary RCMP, Mission Crime Prevention Office and volunteers, Mission Fire Department, MP Traffic Control, Mission Optimist Club, Mission Towing, Save-On Foods, Stage, Terry Wells, all the judges, and of course Santa and his elves for coming to Mission. Also, a massive thank you to all of our business community sponsors. This historic festive event would not be possible without you! Proud recipient of the PRESIDENTS CLUB MEDALLION CLUB AWARD 2017 Mindy the TOP REALTOR® of the 3000 Fraser Valley Real Estate Board Realtors, Year after Year! Put your trust and dreams in the hand of a REALTOR® who excels at achieving only the best for her NUMBER ONE priority: her clients! Why settle for less! Kathleen Rake and Rick Rake of Click Media Works, a communications firm based in Mission, serve clients from around the world. Go to ClickMediaWorks.com to learn more. arts, government, tourism, and social causes in the Fraser Valley. As early-adopters/teachers/influencers on social media, the Rakes are also known to publicly chronicle their community, travel, food and wine experiences with a sense of humour. Click’s tailored and winning strategies earn praise from the people they work with, who include titans of development and politics to authors, business leaders, and individuals/ organizations that truly make a difference. Click offers custom-built writing and consulting packages to fit the budgets of those seeking effective communications solutions. New is a four-piece PR KICK-START package (media release, advertorial, ‘about us’, professional bio). Contact Click Media Works: 604-556-6459 or Kathleen@clickmediaworks.com. 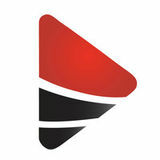 For writing tips and a listing of Click Media Work’s services, click on ClickMediaWorks.com. $75 available online at missionchamber.bc.ca or by calling 604-826-6914. Jason – Your Service Specialist for Expert Auto Service. Members of the Mission Regional Chamber of Commerce receive 10% off regular monthly storage fees with Extra Storage Now! at their Mission and Abbotsford locations. All units are climate controlled and are outfitted with a monitored security alarm. 13 sizes available, ranging from 5x10 up to 25x38. Extra Storage Now! is one of the many benefit providers at the Mission Regional Chamber of Commerce. There are also travel programs, extended health benefits, fuel discounts, realtor offers, and so much more. The Chamber represents Advocacy, Benefits, and Connections in our Mission Community, supporting the backbone of business success. 30.1 cc / 1.3 kW / 3.9 kg (8.6 lb)* *Weight without fuel. MAKE GARDEN CLEAN UP EASY THIS WINTER! Learn how Chamber membership is an effective strategy for your business.